Sorting through my photos today to try and release some additional storage space I came across this absolutely awesome Tiger from last year. Lee created this piece on my daughter Poppy’s thigh and I think it is an absolute showstopper! Lee had the idea of adding to this thigh piece with a range of beautiful animals all in similar triangular shapes to create a leg sleeve. Whilst I do think this would be a spectacular leg piece Poppy has decided to go for something a bit more floral when she adds some surround to the work. 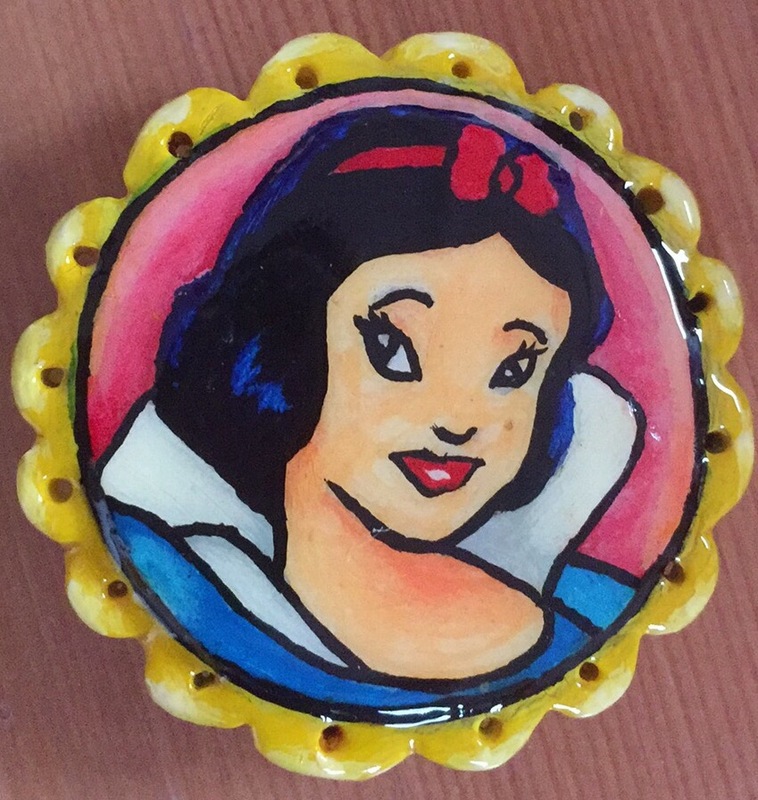 So…we have a little shop on Amazon (Handmade at Amazon section – which sadly doesn’t allow us to sell our quirky clothes and Tshirts yet) where we showcase some of our arty farty stuff. In the shop are some of our hand-painted and hand-appliquéd handbags and briefcases, and we also sell prints of Lee’s awesome artwork. Every print is strictly limited edition and with Elvis, Bowie and other icons we have lots on offer. 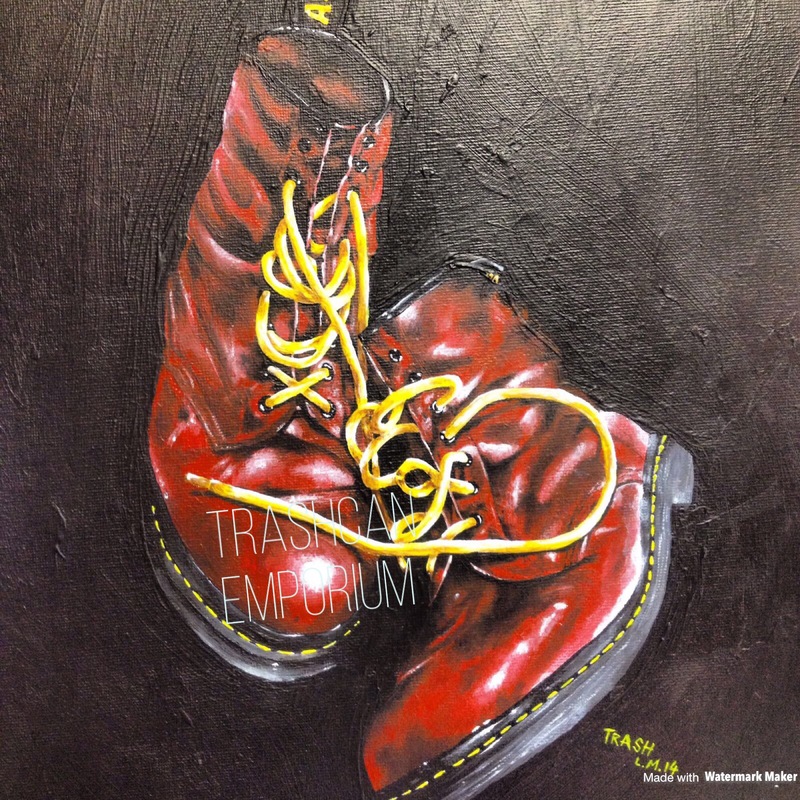 However our top selling item in our shop is this awesome Doc Marten’s print which has been in high demand. Just recently one was bought as a wedding present for a couple of old skinheads. 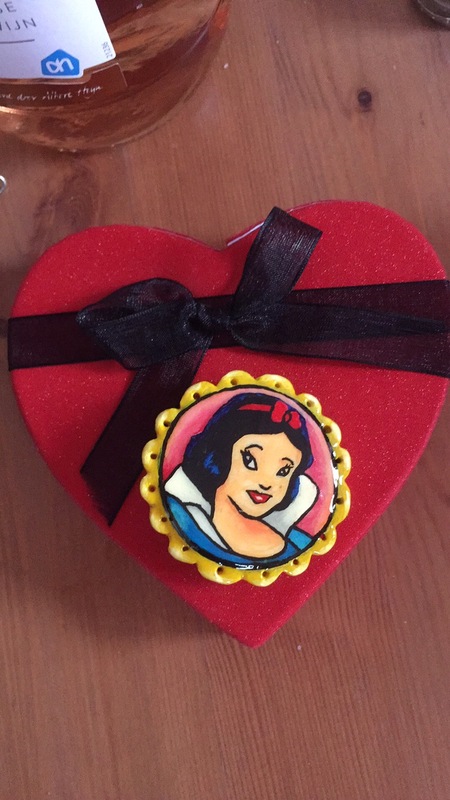 What an awesome wedding present huh? I love that Lee’s artwork is displayed in homes all around the country. Lee thonks that like all good artists his art will probably be worth more when he is dead … I much prefer the thought of people enjoying his art whilst he is definitely alive and kicking (in his Doc Martens of course). 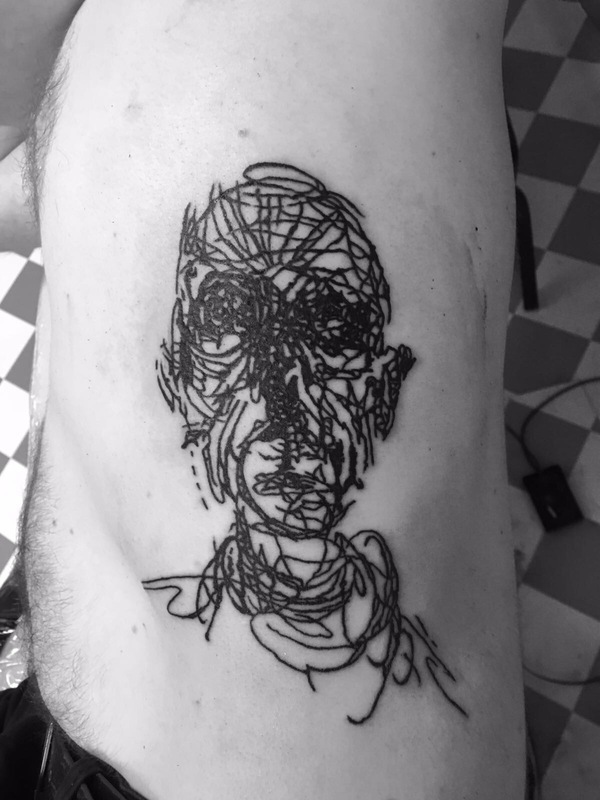 Lee recently completed this wonderful tattoo inspired by piece of art by Alberto Giacometti, a Swiss born painter and sculptor who died back in 1966. Our customer’s son was undertaking an art project and the striking image dropped out of his art folder and dropped to the floor. It was found by his fascinated father who immediately thought it would make a pretty great tattoo. Of course, with Lee as your tattoo artist, it makes an absolutely spectacular tattoo! 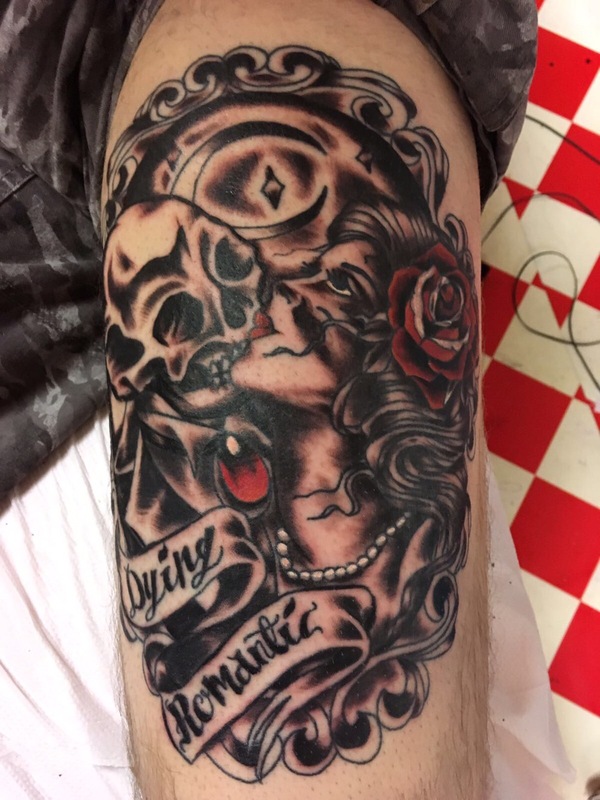 Lee recently completed this amazing tattoo on one of our regular customers. The customer is also an artist currently creating some wonderful pottery work, and Lee always enjoys their arty farty chats whilst he works. 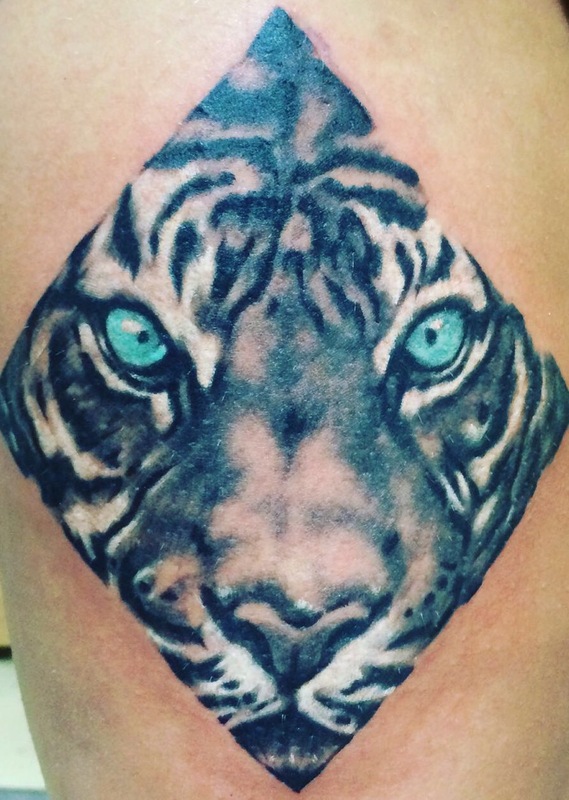 The customer drew up this beautiful design himself and Lee brought it to life on the skin. I am such a girl. I unashamedly adore frills, bows and buttons. 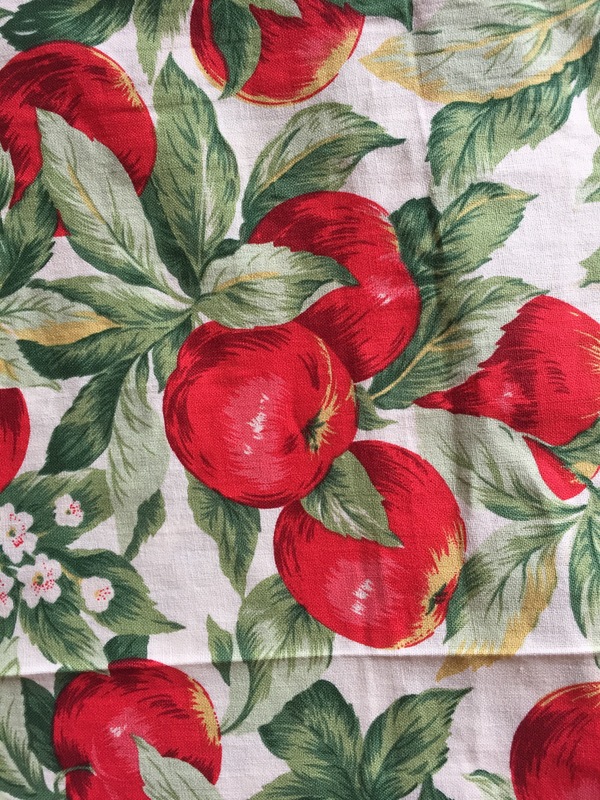 As soon as I saw this stunning fabric printed with rosy red apples it reminded me of the sort of fabric a frilly 1950’s pinny would have been made of. 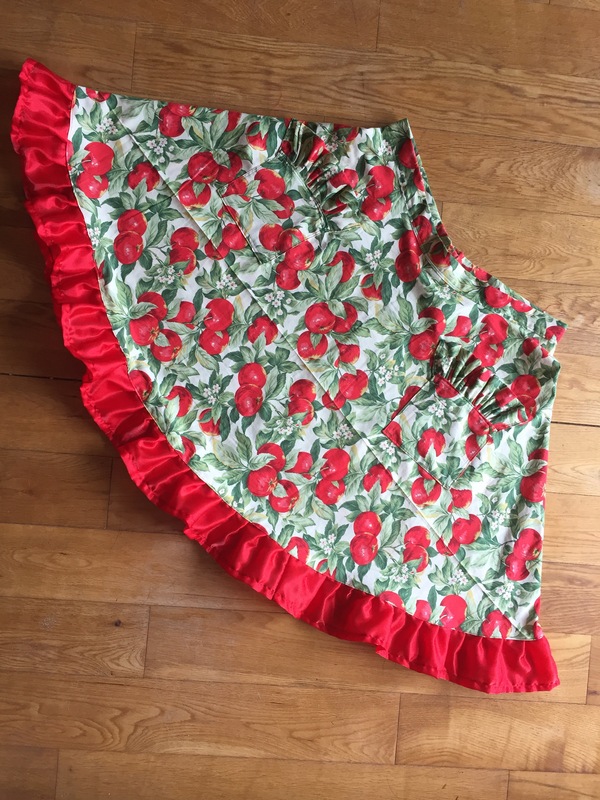 It was this that inspired this frilly, half circle skirt made using my own design.